I have a bad habit of bringing (the verb Cameron prefers to use is dragging) home furniture that needs some kind of rehabilitation, and then letting it pile up in an unwieldy heap in the storage area of our house. I wouldn’t say there’s a mountain of projects waiting out there, but it’s not a molehill either. One of my goals in starting this blog is to tackle those woebegone (but loaded with potential) pieces of furniture, and to document my attempts to resuscitate them. This weekend, I decided to start small and with a low stake piece–something that wouldn’t devastate me if I screwed it up. I got this little upholstered table/footstool/bench at a thrift store for $5. 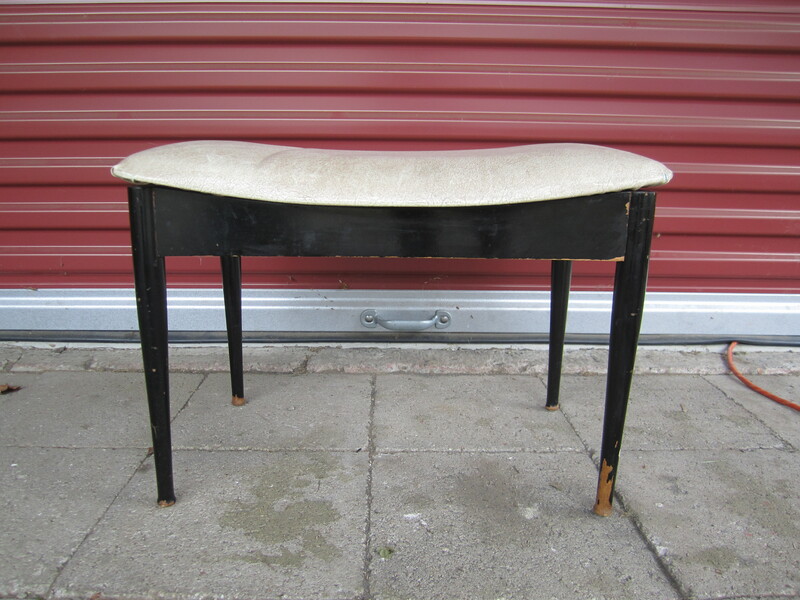 It’s not a spectacular piece, but with its cute little bulbed feet it had the potential to be a lot better once I got rid of the dirty cream vinyl and chipped black paint. I was hoping that the wood under the paint would be salvageable. Rather than using a chemical paint stripper – the last time I tried it ended with disastrous results – I decided to sand off the black paint. I put on a mask and safety glasses and went to work with an orbital sander. The paint came off reluctantly, smearing a little and leaving charcoal-like streaks. It was evident (and I was grateful) that the table had only been painted once, so there weren’t many layers to remove. Because I was nervous about ruining the little bulbed detail at the bottom of the legs, I sanded that part by hand. About an hour and a half later, much of which was spent trying to get into the crevices where stubborn paint still clung, I had a pretty little red oak table. 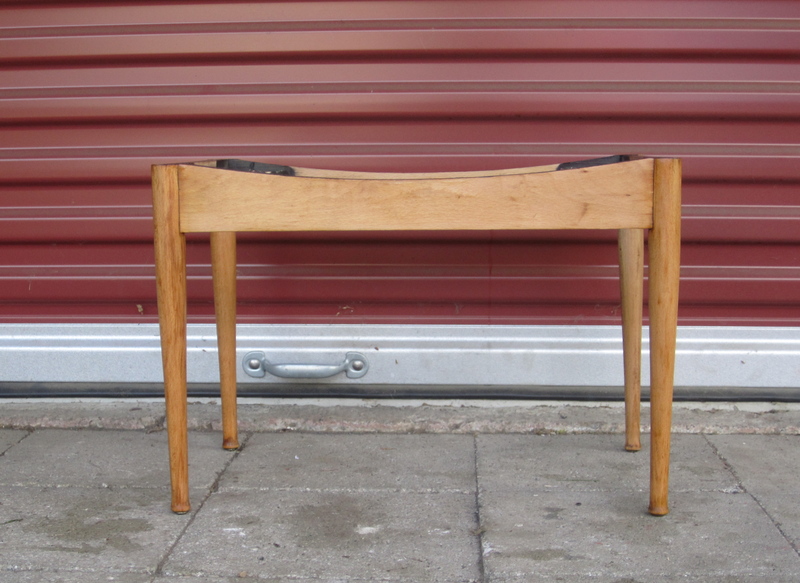 Rather than stain it, I put on a coat of neutral Restore-a-Finish followed by Howard Feed & Wax to condition the wood. 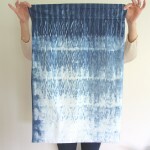 I’ve been really inspired by the indigo textiles that are so popular right now, and I’ve wondered whether I could make something similar using fabric ink and a stamp. This seemed like a good time to try! For the print, I used a pattern from Lena Corwin’s book ‘Printing by Hand.’ It’s a wonderful book and her instructions are very clear and easy to follow. 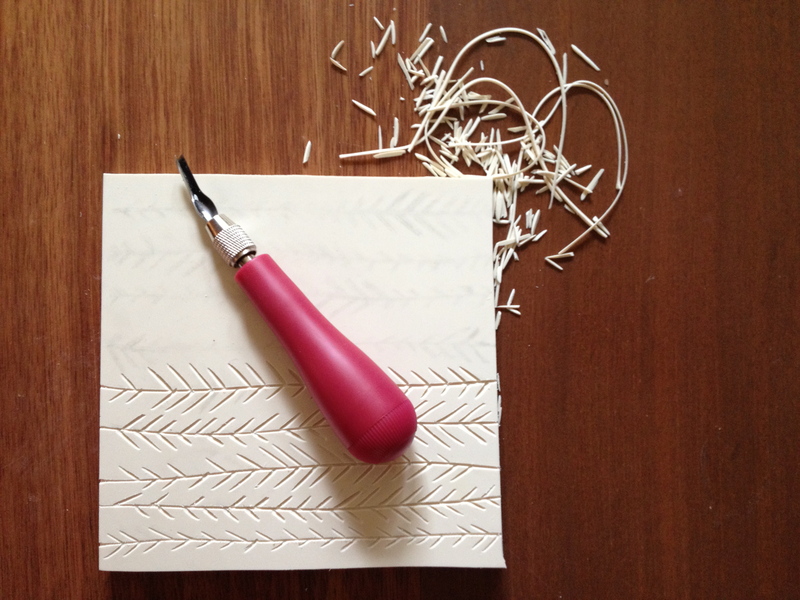 To make the stamp, I used Speedball carving tools and a soft carving block called Moo Carve I got at the craft store. 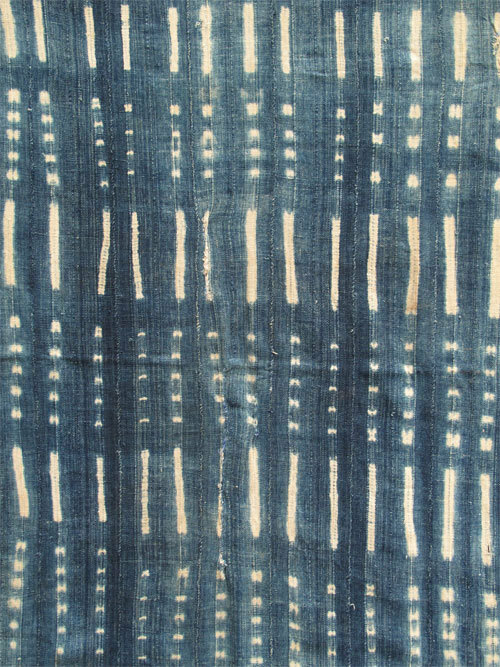 I had a few kinds of ink already from previous projects, and I experimented a little trying to mix up the indigo color. The basic recipe that worked for me is two Tablespoons of blue ink to one teaspoon of black ink. 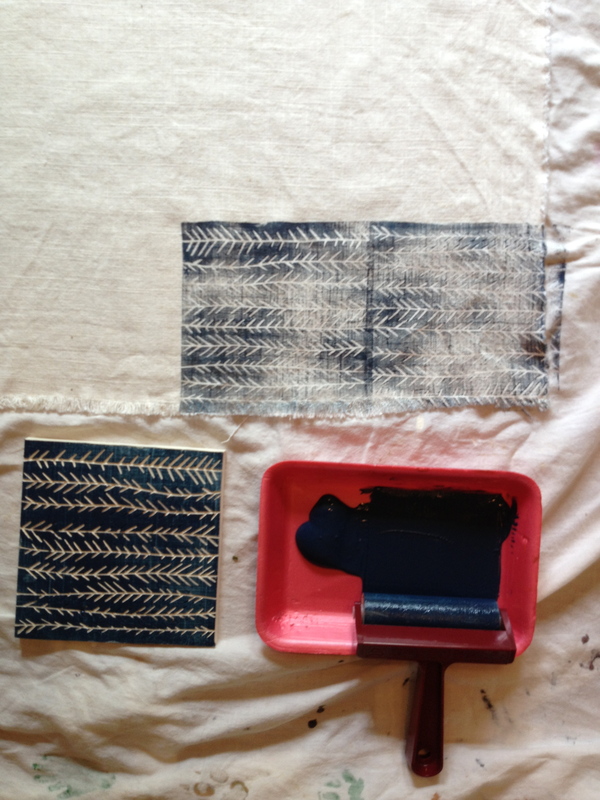 Once I had a color I liked, I did some test prints on a scrap of fabric. The variation of pigment is from the amount of pressure I applied to the stamp. 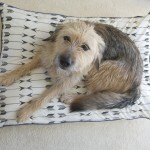 For the cushion cover, I used a piece of natural colored cotton-linen left over from when I made our living room curtains. It had already been washed, so I ironed it flat and traced around the original vinyl cover that I had removed. 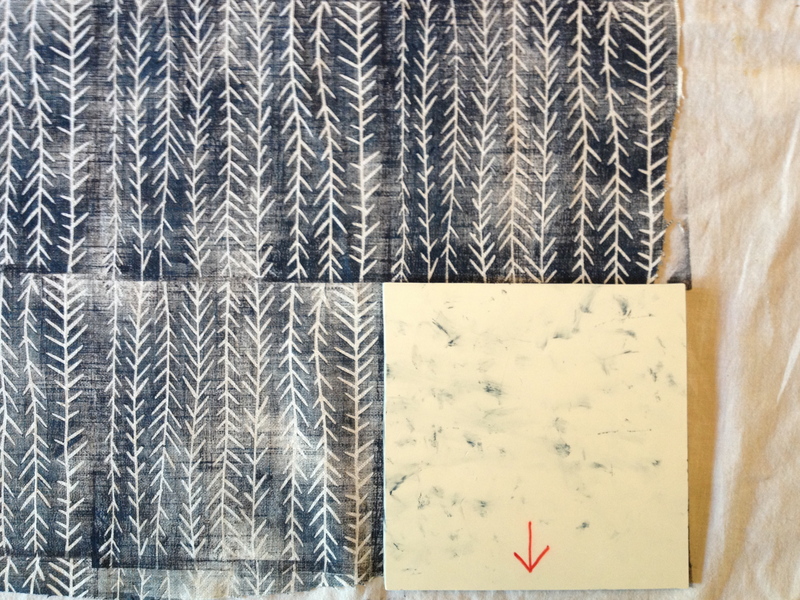 Then, over a drop cloth laid on our dining room table, I started printing in a grid pattern. I drew an arrow on the back of the stamp with a Sharpie to help me orient it correctly as I stamped. 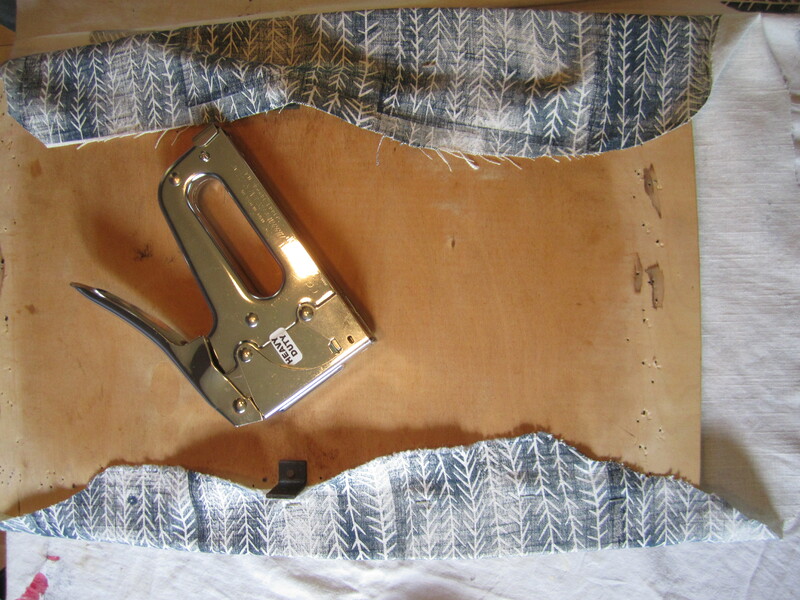 When I was done, I let the fabric dry for a couple of hours then ironed it again to set the ink. 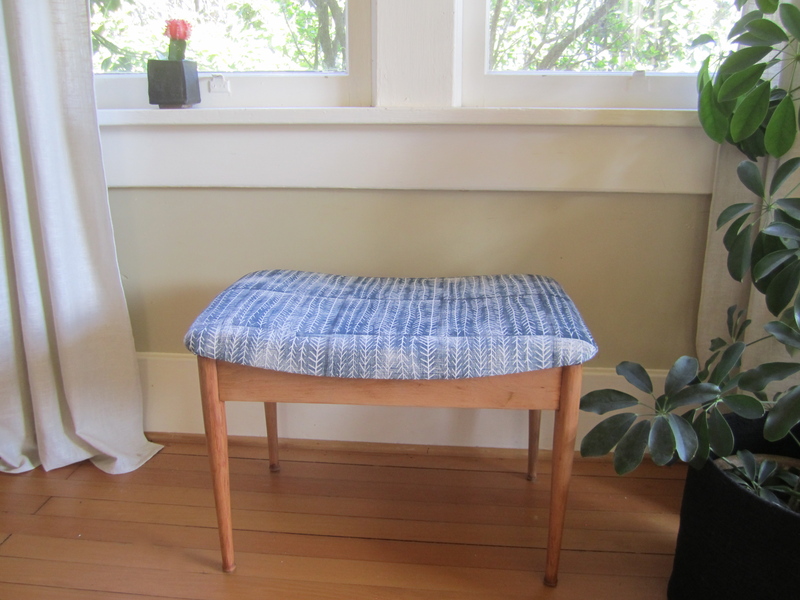 Rather than reusing the nails that held the original vinyl to the stool, I used a staple gun to attach the newly printed fabric—stretching it and smoothing it as I went. I really like how it turned out! 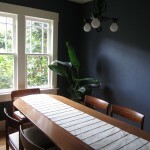 The color of blue is pretty close to what I wanted and the natural wood is a big improvement over the old black paint. 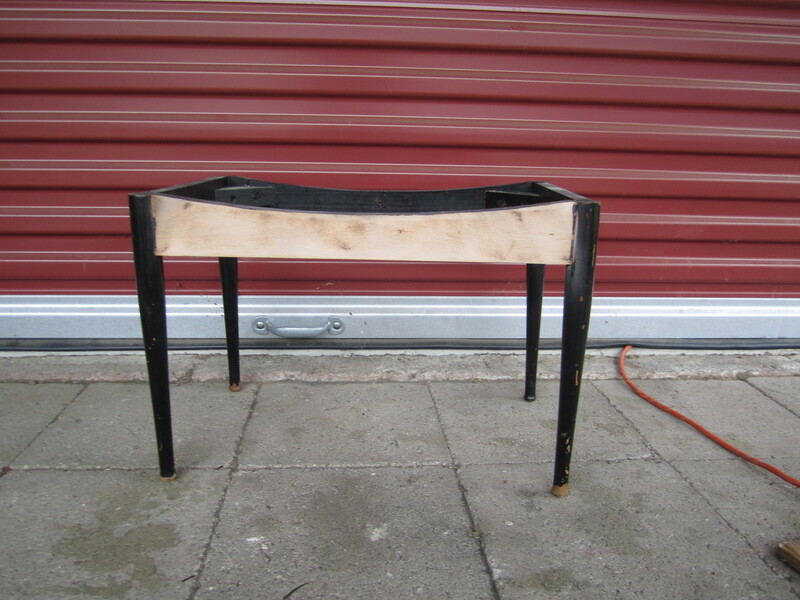 Best of all, it’s usable and no longer sitting in a heap of other project pieces in the storage room. 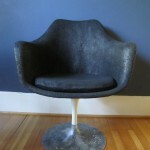 For now I have it in our living room, where it can be used as a footstool or an extra perch. Down the road, I might move it to our bedroom or the guest room. Thanks for reading this post! Do you have questions? Please feel free to ask them in the comments. Oh Katie – bravo! 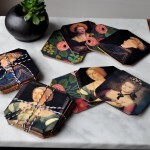 I am in awe of your orbital sanding and enchanted by your block printed perfect fabric! You make it look so doable, if one of your goals here is tackle that pile of found (dragged home) objects, you are not only launched, your pictures and story inspire me to make! While TinyTiger looks terrific on his cat bed, I’d love to put my feet on a stool of such height! Thanks, and now please head out to the storage area, we are eager to see what is next! You have a good eye for possibilities! 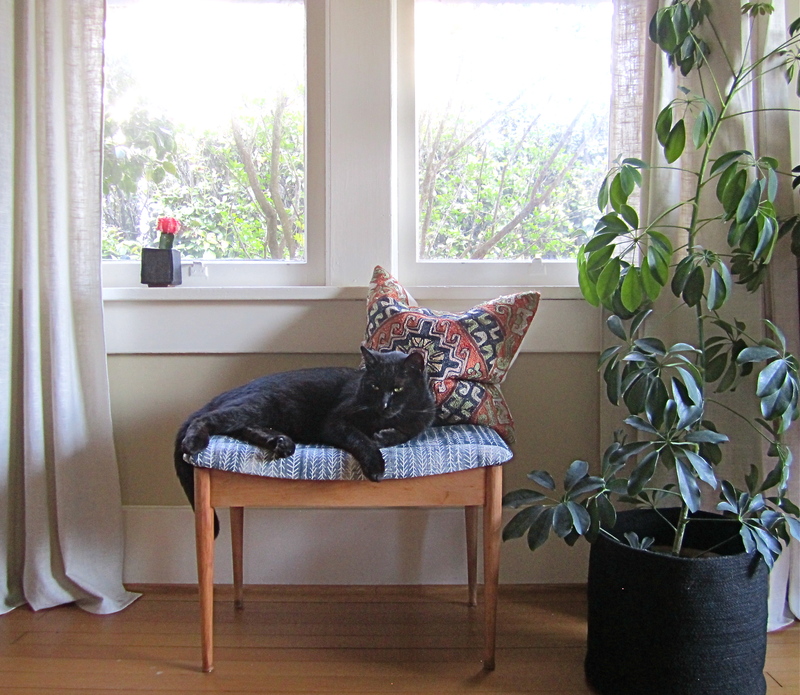 From dreary and dingy to a celebration of this blue and white spring day, complete with contented and cushioned cat. I recognize that little pillow cover — the Cretan Market in Krista. It looks really good, Katie. Especially with Carl lounging on it! Thanks Donna! Carl is the perfect home accessory. I had to be out of the house all morning, and I kept thinking, “Can’t wait to get home so I can see what’s doing at Red House.” I wasn’t disappointed. 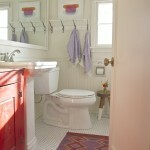 Your approach to that stool is so different from what I would have done, and I love that about your blog. Your fabric printing came out great. I’m impressed. Well done Katie! 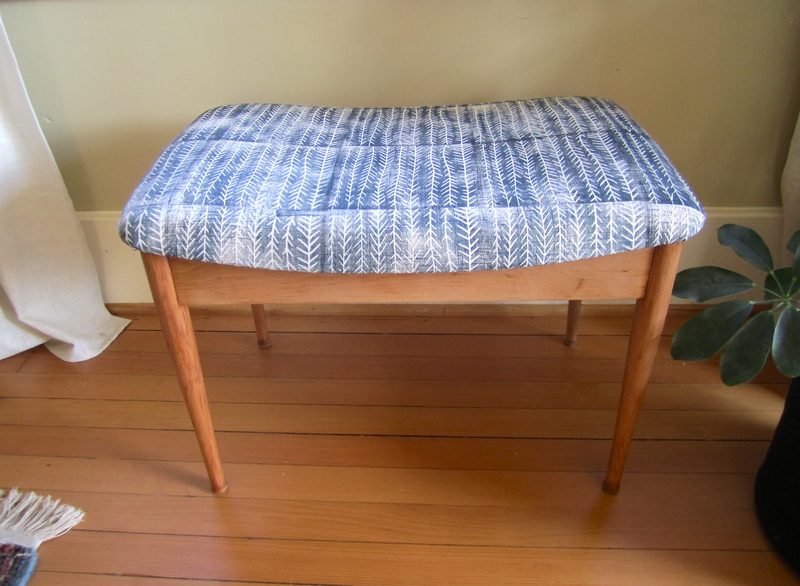 You’ve given your bench a great new life, and I especially like your fabric! I just hope now that Carl will share. It was one thing to refresh the woodwork but making the print really added a touch of you to the piece. Well done!